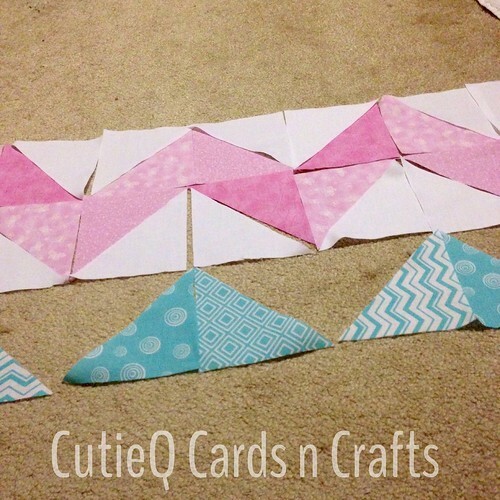 CutieQ Cards n Crafts – Chevron Quilt Part 2 | Living life in the carpool lane.. Living life in the carpool lane..
Progress on this quilt is a lot slower than I’d like to admit. Ideally, this quilt should come together quickly. It’s finding the time to get it done that is proving to be difficult. I am determined to get this quilt completed before the weather starts to cool off. Plus, posting progress on the blog gives me a bit of accountability. Ok.. so here we go.. When we last left off, I was cutting fabric into triangles. I finished that and began arranging the triangles into the chevron pattern I love so much. I laid out the entire quilt. It gave me an idea of how big the quilt might be and how many triangles I really needed to create the quilt. Then, I started putting the half-square triangles together. The final half-square triangles are smaller than the original square! Ok.. maybe I should have known this, but I didn’t. On the left is the 5in square I created all the triangles with. 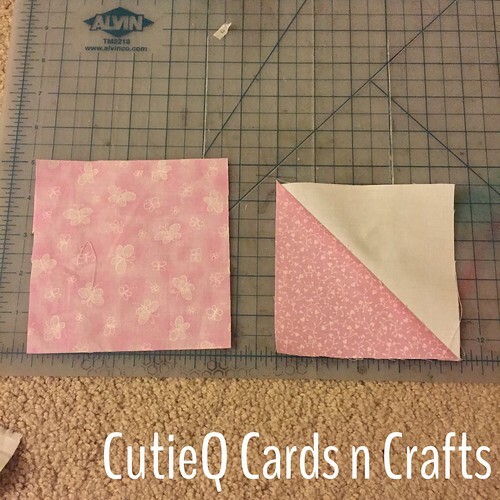 On the right is the completed half-square triangle that is now a 4.5in square. It changes things. My original layout of the quilt showed how big the quilt will approximately be. Now, I might have to add extra rows and columns to make it the size I desire. Good thing I have a lot of extra triangles to play with. I have to finish sewing all the half-square triangles together before I can decide if I need more. I’m hoping at the next update, I’ll have a better idea of what I’m doing! 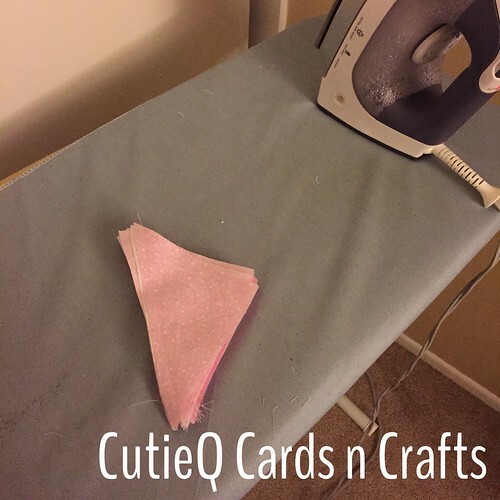 2 Responses to "CutieQ Cards n Crafts – Chevron Quilt Part 2"
It may be slow going, but it looks fantastic! Keep up the great work. We went to a pet store! ABC Artsy Craftsy... Baby food Blast to the past Boyfriend.. girlfriend.. relationships.. Bun in the oven.. Church rulez CutieQ Cards n' Crafts Here comes the bride.. Hooray for Hollywood! In all seriousness.. In the kitchen.. My life as a musical.. Oh, the many lists.. Parenthood Random-isms.. Review.. for YOU! Sewing She worked hard for the money! Thankful November The "married" club.. The crystal ball.. Things my daughter says.. Things my husband says.. Toddler necessities Toy review Trials and temper tantrums Uncategorized Weight control You know you're a parent..